Marcus Foster first gained notoriety for his spectacularly successful transformation of two of Philadelphia’s worst schools. He brought new school pride and enthusiasm to the students and faculty, brought parents and local businesses into school activities, and pressured the Board of Education into funding new programs and facilities. Foster was Philadelphia’s Man of the Year for 1968 and received prestigious awards from the NAACP and other organizations. Although he was a strict, no-nonsense educator, he was no conservative and no political suckup. He criticized the institutional racism of the school system and worked hard to both celebrate ethnic diversity and have it reflected in the positions of power within the educational hierarchy. Faced with a soaring dropout rate, nonexistent school morale, and plummeting proficiency scores, the Oakland, California School District sought out Foster to fill the position of superintendent. Foster took Oakland by storm. His reforms were as effective as they were drastic. He decentralized the 90-school school system into three separate regions and gave each an associate superintendent with a local office. He brought about previously unheard of student, parent, and teacher involvement and reach out across racial lines in the diverse Oakland community. Proficiency scores soared, the dropout rate fell, and morale was boosted radically. Freshman nowadays in already-troubled colleges exclaim, “Wait till the high school kids get here!” That only adds a wider dimension of value to this book’s contents, which Marcus Foster has somehow found the time to share. 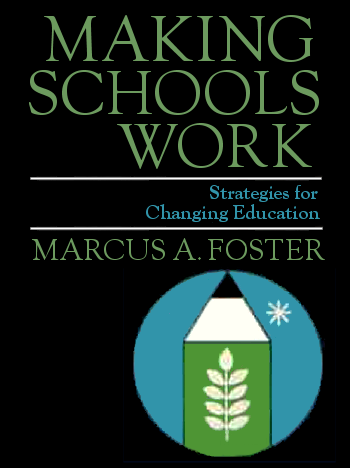 All educators, working at whatever level, have a very real stake indeed in what Making Schools Work has to say; but it is on the precollege firing line that Marcus Foster’s brilliant career is being carved out, and that is where he has gained his dues-paid expertise. The tone of the book mirrors the man whom I have become privileged to know and for whom I feel a deep respect. With his natural-born matter-of-factness and affableness he will hit a ghetto street, ringing doorbells (“Hello, I’m the principal from Gratz”), or will cross the country on a midnight plane to exchange dialogue with other erudite educators. Therefore, far from being lofty rhetoric, this book is simply Marcus Foster’s offering, in his own warm way, of forthright views derived from the problems he has faced. He offers for colleagues’ consideration actions he has taken in volatile circumstances—actions that bear the authority of having worked. Marcus Foster goes farther—he takes us behind the scenes with insights into why various actions worked. He helps us look into the welter of fears and uncertainties occurring today wherever pupils, black or white, are being bussed to achieve racial mixes; or wherever once lily-white residential school communities are rapidly darkening. Marcus Foster holds up a candid mirror to educators, students, parents, school boards, and communities, so that all who are involved may look at themselves. The next book by Marcus Foster may very well be about the diverse challenges with which he will surely be dealing as he continues in his present post as the first black Superintendent of Schools in racially charged Oakland, California. The public reactions when he arrived ranged from sympathy for whoever would undertake the job, to hyper-militant dubiousness that the touted “mouthematician” from Philadelphia could last even the traditional “honeymoon” year. As he entered his second year, however, it was accepted by all that Marcus Foster certainly seemed determined to revitalize comprehensively a troubled metropolitan school system. He was ready to “retool” by any means necessary, to provide better, more relevant education for the multi-ethnic students and community the school serves. He concludes this book most appropriately with his first speech to the staff—whom he advised, “The reward system will work for those who dare to take risks.” I feel no risk at all in reiterating that there are no American educators, or members of school boards, or student bodies, or parents, or concerned citizens, who will not find enlightenment and wise counsel about the administration of schools in our present, testing times through a reading of this book. ~ Alex Haley.